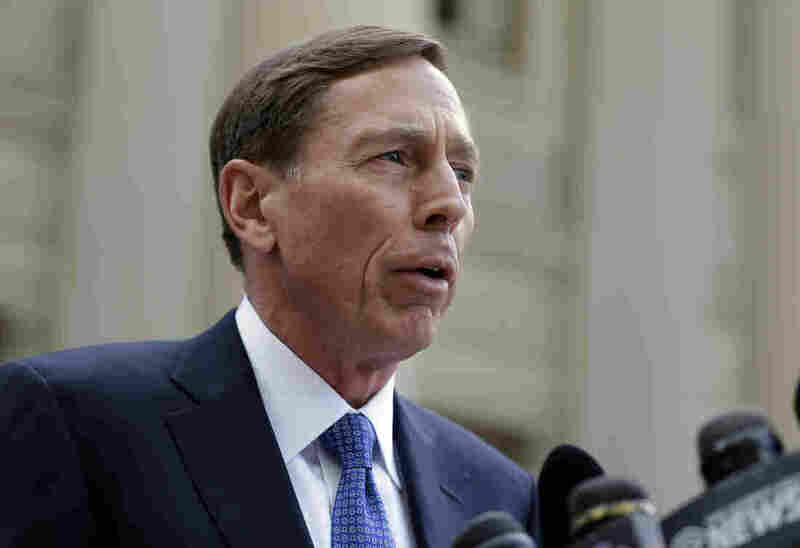 Luminaries Across Political Spectrum Filed Support Letters For Gen. Petraeus : The Two-Way In letters of support, Republicans and Democrats pleaded with a judge to keep Gen. David Petraeus from jail, after he pleaded guilty to revealing government secrets to his biographer. Former CIA director David Petraeus leaves the federal courthouse in Charlotte, N.C., in April after pleading guilty to sharing top government secrets with his biographer. When a judge was considering whether to send retired Gen. David Petraeus to jail over his unauthorized disclosure of classified information, he received letters of support from more than two dozen luminaries of different political stripes. Republican lawmakers such as Sen. Lindsey Graham joined Democratic ones such as Sen. Diane Feinstein in asking U.S. Magistrate Judge David C. Keesler to keep Petraeus out of jail. The United States District Court for the Western District of North Carolina made those letters public last night in response to requests from media organizations including NPR. Many of the people writing the letters told Keesler that Petraeus still had much to give in service of the United States and that should inform his sentencing decision. Thomas Donilon, a former national security adviser in the Obama administration, went so far as to say that it was "in the national interest to have General Petraeus fully and freely involved in helping to set the nation's course." -- Sen. Feinstein wrote that Petraeus "recognizes the error of his actions." -- Sen. Graham wrote that Petraeus had already been embarrassed by the situation and has "quietly suffered." -- Former British Prime Minister Tony Blair wrote that "the world needs his continued engagement and presence." It's worth noting, as the Intercept does, that some of the people who wrote letters in support of Petraeus had in the past advocated for strict anti-leak laws. Keesler ultimately decided not to send Petraeus to jail. He sentenced the retired general to two years probation and handed him a $100,000 fine.